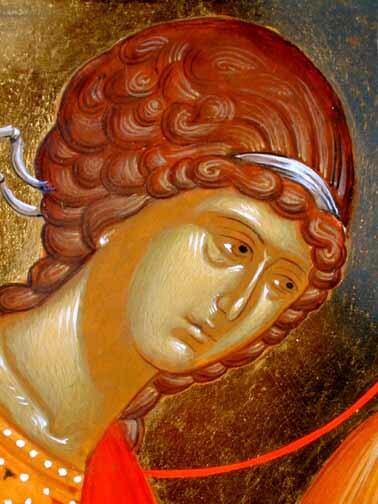 The following photos detail the painting of a face on an icon using the traditional egg tempera technique. A more complete description of this process is described in this article. The original drawing done in red ochre. 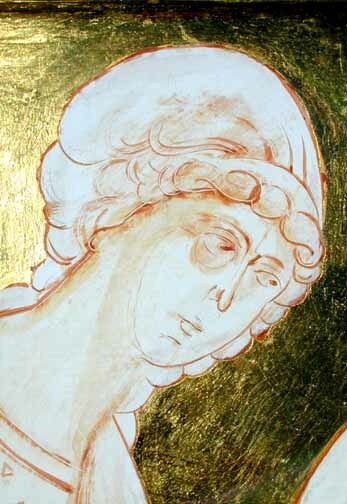 Red clay bole has been applied for the gilding. Gold leaf has been applied and burnished. First layers of the flat colors have been applied. The flat colors have been built up more. The flat colors are complete and dark lines have been painted. The highlights have begun to be applied. Highlights are more fully developed, but not yet complete.